Best Friends Animal Sanctuary’s dog handler John G arcia , known for rehabilitating 22 of the 49 dogs (now affectionately referred to as the “Vicktory Dogs”) seized from the bust of the Michael Vick/Bad Newz Kennels dog fighting ring, will be in town this weekend to participate in the two-day, family-friendly, Love-A-Bull event. Free to the public! Dogs on leash are welcome. Chairs are not permitted, but blankets or towels are encouraged. A public screening of National Geographic Channel’s “Dog Town,” including footage of John Garcia working with the Vicktory Dogs at Best Friends (begins at 7:30 PM). Free to the public! 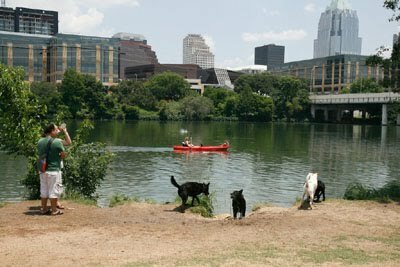 Bring your leashed loved ones and the whole family for this walk through downtown. Austin Java and Lofty Dog will provide rest stops, and there will be prizes for best human and dog costumes! DJ Yoshi will be spinning tunes for your enjoyment. Free Parking in the City Hall Garage (entrance on Lavaca).